Do your kids ever slide around on your toys? My kids love to step on cars, papers, balls, or even travel sized changing pads and use them to skate around our kitchen and family room. Usually the item they pick ends up leaving a dent or a scratch in our wood floor... so I quickly distract them and get them to try something different. 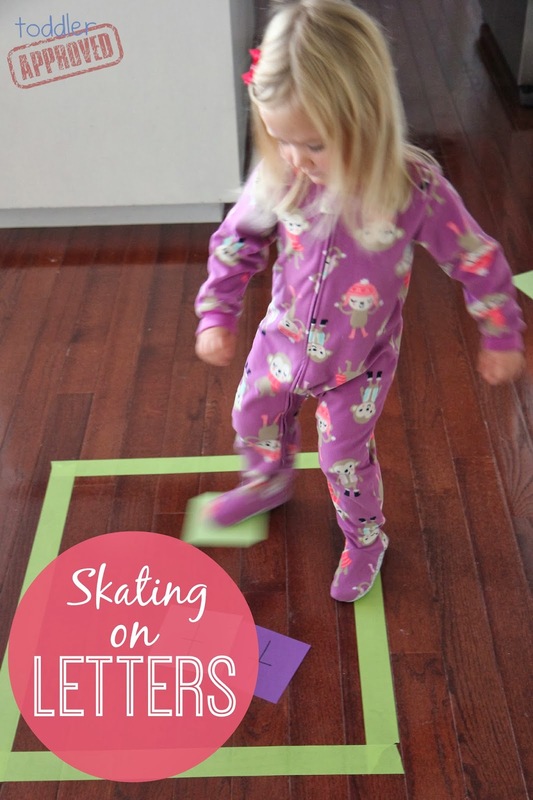 For this week's Move & Learn post I decided to take my kid's obsession with skating around on objects and turn it into a learning activity where we are skating on alphabet letters!! Start off by cutting each piece of cardstock into half. Then write alphabet numbers on each half piece of cardstock (one on each piece). You don't need to use the same color for matching letters, though you can. Once all the letters are written (I only focused on 5-6 letters at a time and for our first time we used the letters in my daughter's name), then spread the cardstock letters around the room. Make a large tape shape square in the center of the room using painters tape. Explain to the kids that they need to step on one letter at a time and help skate each letter into the blue square. Once they've done one letter they need to find it's pair and skate it over to the other letter that is inside the square. When the activity is over, each letter should be inside the painters tape square and each one should be next to its letter buddy. We also used the letter cards to practice spelling her name in order! I made her name once and then she skated the letters over to match. This is an activity that can be left out so kids can play it again and again. It would also be fun to do with numbers or even addition facts! We love making up games where we can move and learn... especially now that it is getting darker earlier and the weather is colder! We need more things to do inside that keep our bodies moving in different ways. What's your favorite way to move and learn? Our Skating on Letters game is part of the Move and Learn Series that I am participating in along with Hands On: As We Grow, The Pleasantest Thing, and Coffee Cups and Crayons. Make sure to check out this week’s other Move and Learn activities below and then join the four of us next week for even more move and learn ideas! Awesome. So fun! I just LOVE all your activities!